If you had asked me ten years ago, whether I find the keys we are going to talk about in this post any useful, I would have said NO. But ironically, I use them quite a lot these days and I cannot live without them as well. If you program or do document editing a lot you will understand the importance of Home and End. There is no quicker way to get to the start and end of a line. Ctrl + the arrow keys, can be used to move over words rather than characters. Can be really useful for programming and document editing. I cannot live without this. Just makes navigation faster and easier. Again, for people who handle many lines of code on text editors and huge documents, there are no better friends than Page Up/Down. Scrolling can be the most annoying thing sometimes on the mouse and these keys work like a charm in these situations. F2 is one of those keys you cannot live without whether you are browsing files in a file explorer or working in an excel. F2 can be used to rename a file or edit a cell swiftly. It is very handy. This combination is extremely useful on browsers. They reopen closed tabs. The function may prompt you to ask if this is really that useful, but once you start managing tabs in the order of 10 to 15 or more, you will start realizing the need for it. Those would be my top five. Of course the obvious ones like Ctrl + S for save; Alt + Tab for window switching; Super + L for locking the pc and just the Super key for entering into the search menu on Ubuntu are really important too. There are a lot of shortcuts that pertain to specific software and are really useful, but I wanted this list to be as generic as possible. We live in a day and age where mobile phones are as common as shirts and pants. There is a good possibility that a lot of good phones that are lying around in your house which can be put to good use. Here I list a few ways in no particular order. Some of these functions can only be performed by a smart phone, some by ordinary phones as well. Download Manager – If you have a slow wifi connection at home, your downloads might take a really long time to complete. If you have an old android phone lying around, you can install a torrent downloader on that and any sort of download manager that you need and start downloading. You might have some old memory card lying around as well. If that is the case, then well and good. You are all set for your download journeys. This is less power consuming as opposed to leaving your desktop on all the time as well. Timer – Timers come of good use in a lot of places. For example, in the kitchen; when you want to time your game time, tv time and so on. There is one good technique called the pomodoro technique that works based on the principle of concentrating for 20 minutes and then relaxing for five. Repeating this set three times and then taking a long break for 15 mins at the end of those three cycles. It can help you be more productive. I have tried it and it works. Use your old phones for that, you will save yourselves from the distractions of all the notifications from your current phone. Music Player – Your current phone may have a lot of space, but I am sure you would want more. Why not push all the music to your old phone and just have the hits on your phone. This works well if you don’t own an iPod and you probably don’t need to. An old phone works really well for this. GPS Device – How many times have you been frustrated with maps and GPS consuming your battery like crazy. Why not use an old phone for that. You don’t have to worry about your phone going out of battery at the end of the journey. Sure you can use your car charger but isn’t it less fussy to just forget about having to charge your phone all the time. E-Reader – If your old phone has a good screen you can use it as an e-Reader and save battery on your current phone. Backup Phone – When you have your old phone lying around for any use mentioned above. You will have it charged. This will come in handy when your current phone dies and you don’t have a power bank with you. Fitness Tracker – Install a fitness tracker that requires just your accelerometer and your GPS. You will again not have to worry about your battery draining in such activities. Donate It – Last but not least. Rather than just keeping in a shelf and letting it die, give it to someone who really needs it. You will have earned their love. For long, I have always been confused about how word creates a hyphen in some places while it is just a short minus in other places. If you are wondering about the difference, the hyphen is usually longer than a minus in MS Word. Quite curious as I am, No one ever bothers about such small things as a hyphen so I have never searched about it anywhere. But recently I stumbled upon the solution. It just so happens that when you add a minus plus a word after that and a space after the word, the minus becomes a hyphen when you hit space. It doesn’t matter if you have a space between the hyphen and the word though. So if for some reason you don’t get the hyphen you probably must’ve hit Enter instead of space. Previously I wrote an article that explained MIDI and VST. But there is more to MIDI than that. There are a lot of good things you can do with the MIDI ports, both in the studio and on stage. I’ll try to cover a little about what these ports can do from my personal experience. Shown in the image is the rear panel of my Keyboard. This I took from my keyboard manual. On the left are the two MIDI ports on my keyboard and this can be connected to either your Audio Interface, Sound Module or any MIDI operable machine which would have the same two ports or just the IN port alone. Please note that the OUT of one device is connected to the IN of the other device and vice versa. A sound module is a device that contains all the sounds that you would commonly find in a keyboard in a small box which can be used with a MIDI enabled keyboard. So your keyboard does not need to have a lot of sounds. Just needs to have MIDI and you can add many sound modules as Racks for performance or in the studio. It’s a box of all the cool sounds in a keyboard but with out the keys. Cool right?. The basic configuration is connecting the OUT of the keyboard to the IN port of a Sound Module or Audio Interface. What happens here is that the MIDI data from your keyboard is now fed to the Sound Module and based on these notes, audio in the form of wave is sent from the sound module to the speaker or line connected to it. In the case of an Audio Interface which is further connected to your DAW, this MIDI data is routed to your DAW, where it uses the VST in the DAW to convert MIDI data to audio or the MIDI data can be saved as it is. Yes of course, your DAW doesn’t work like a sound module, it saves the MIDI data and produces audio dynamically at the moment ‘when the track is played’, which can be done again and again. 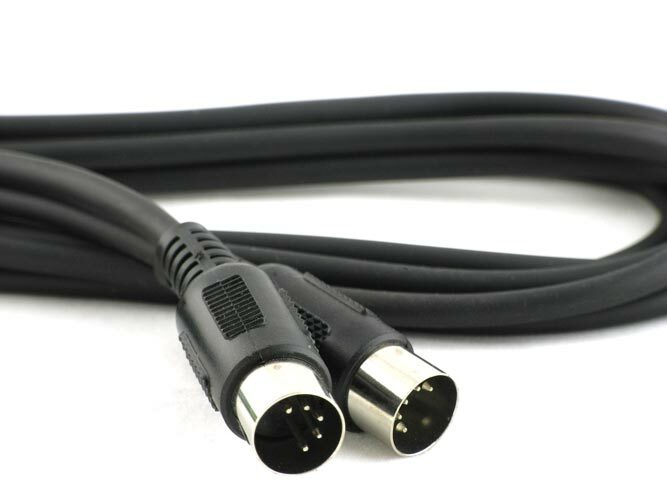 So this seems like you can do everything with this one way connection from the OUT of the Keyboard to the IN of the Audio Interface. What is the use of the connecting it the other way round, i.e from the OUT of the Audio Interface to the IN of your Keyboard? This is where it gets interesting. This will be covered in detail in the next part because it is one super cool thing to do and I think it deserves a post on its own. If you have doubts, comment (preferred because others can make use of it too) or mail me at johananj@yahoo.com.